These dealing with challenging people training course materials have been developed for everyone in your organisation who may face difficult working relationships. It provides the knowledge and awareness to help participants work positively with those around them, whilst also ensuring they keep calm and in control if things heat up. The training course will help build self-awareness, and will highlight the important elements of creating positive workplace relationships. By nature, humans are social beings. However, it is only natural that we sometimes struggle to get along with everyone around us, especially in the workplace. What we tend to forget is that we are assigned work colleagues – we don’t ordinarily have the opportunity to choose them as we can in our personal life. Thus, we have to find ways of working together. These training course materials have been designed to give your participants the skills to work with those people that may be considered a “challenging person”. The skills are mainly aimed at workplace relationships, but they will have the added advantage of helping with personal experiences. The participants will also be given the opportunity to look in the mirror; is that person REALLY challenging, or is their mindset closed to the possibilities of what the person has to offer. How is their behaviour exacerbating a potentially toxic relationship cycle? 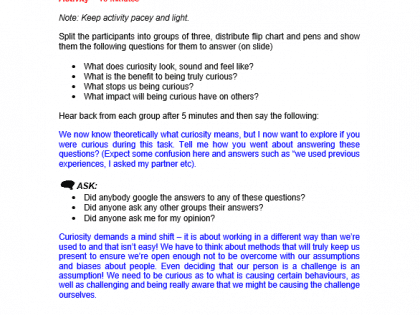 Why is running this dealing with challenging people course a good idea? Build strong relationships with colleagues. Overcome negative communication barriers and improve working relationships. Create a positive work environment through positive relationships. Improve their self-awareness and perform better as a team. Avoid conflict scenarios and adapt behaviour to solve issues. Ultimately these training course materials allow you to nurture a workforce that is better able to work effectively with their team members, or other people associated with the organisation. Improved relationships means improved effectiveness in their role. 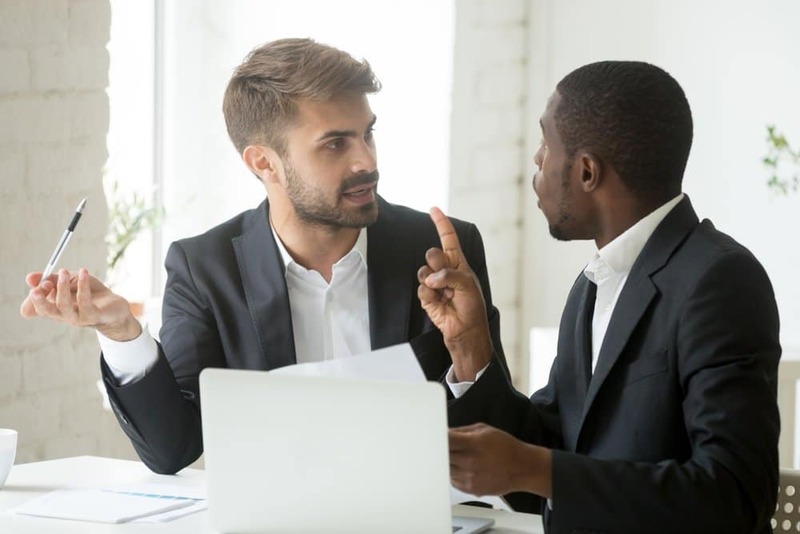 Dealing with challenging people is something we all have to do at some point in our working life, but it is often difficult to know how to go about managing the situation in such a way that problems do not escalate beyond our control. These dealing with challenging people training course materials have been developed to help take the guesswork out of navigating workplace relationships. Judgements – Starting with Us – This session gives participants the opportunity to look into how readily we judge people on a day to day basis, what the danger of this is and how we can overcome it. This also includes a focus on unconscious bias and how it can influence us without us even knowing. TED Talk video used. 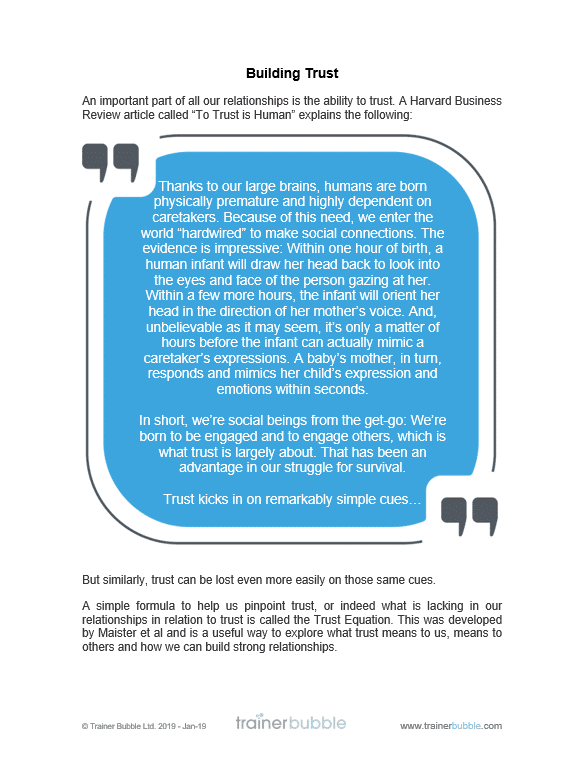 Building Trust – Trust is integral in all our relationships. 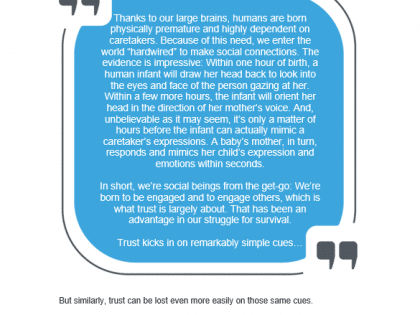 Here we look at the facets of what makes up trust, and how we can improve upon these in certain relationships. Includes ‘The Trust Equation’ that helps focus on elements of trust that may be missing in relationships. Emotional Bank Balance – Using this popular approach to understanding relationships, we will explore what do we need to do to make sure we’re “crediting our bank balances” with others. Empathy – Not Such a Soft Skill – We will explore what we mean by empathy and why it is important in ALL of our interactions. Includes a video from NOVA scienceNOW and several activities to embed the learning. Whose Agenda is it Anyway? – Sometimes the situation we are in can erupt into conflict. Here we will look at how it may arise and what we can do about it. 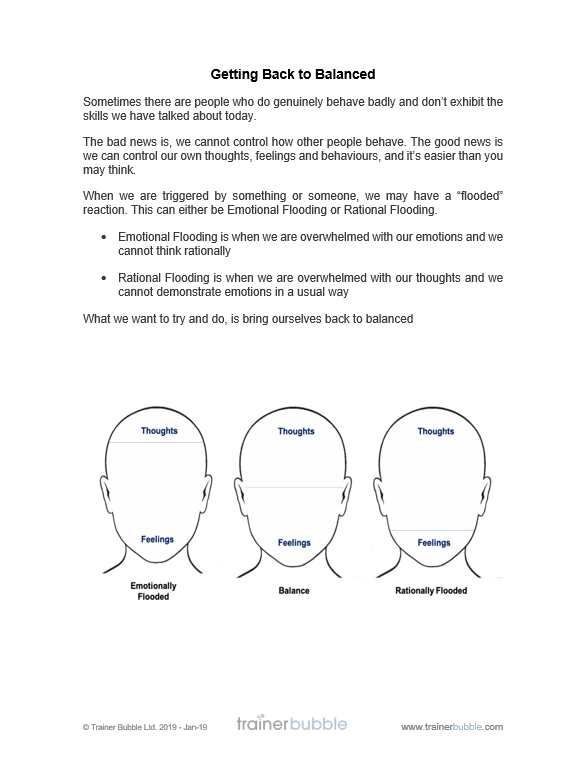 Back to Balance – Sometimes in the heat of the moment in a challenging situation with a “difficult” person, emotions run high and looking at the situation rationally and with empathy is nearly impossible. 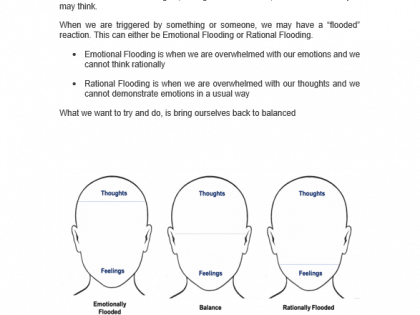 Here we will explore practical tips on how we can ensure we stay calm in these situations.